Plant-derived (non-animal derived, NAD) D-Galactose, plant derived,D-galactose,59-23-4,D-Galactopyranose,NAD,plant origin,plant source,galactose,D-(+)-Galactose,China GMP manufacturer - Herbs-Tech - Zhejiang Yixin Pharmaceutical Co., Ltd.
D-Galactose is an aldohexose that occurs naturally in the body, It is commonly found in dairy products, sugar beets, certain gums and mucilages. D-Galacose is a basic ingredient usually used for creating brain senescence in animal models, increasing glycoproteins production through adding to cell culture medium. As one of primary monosaccharides, D-Galactose can be acted as a basic start material for synthesis of many important intermediates. Certain medications contain galactose as excipient. Plant derived, low endotoxin D-galactose is specifically for biopharmaceutical use, It can serve as a key, chemically defined component to optimize protein production while reducing lactate and ammonia formation. The terminal sialic acid component of a glycoprotein oligosaccharide side chain is known to have an effect on numerous aspects and properties of a glycoprotein, including absorption, solubility, thermal stability, serum half life, clearance from the serum, as well as its physical and chemical structure/behavior and its immunogenicity. The sialic content of the produced glycoproteins is increased and enhanced when D-galactose is added to feed medium. If D-galactose is supplied daily to the cells during the entire culture period, it will increasing the quality of the final glycoprotein product. Asialoglycoprotein receptor (ASGPR) was specifically expressed by hepatocytes, which could recognize and bind asialoglycoprotein, galactose (Gal), galactosamine, N-acetylgalactosamine (GalNAc), etc. with high affinity. Targeted delivery of modified lipoprotein particles, genes, chemically modified oligonucleotides, nucleoside analogue (eg. Ribavirin), small molecule compounds(eg. Doxorubicin), siRNA, and microRNA antagonists to hepatocytes through this mechanism are under developing. D-Galctose is a basic bone acting as the start material for many kinds of pharmaceutical and biochemical intermediate, such as Diacetone-D-galactose (1,2:3,4-Di-O-Isopropylidene-α-D-Galactopyranose) , beta-D-Galactose pentaacetate, methyl-D-galactopyranoside. 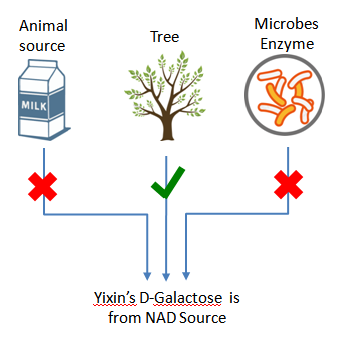 Yixin’s plant derived D-galactose (NAD) is completely from nature tree, non GMO source, developed specifically for biopharmaceutical use. 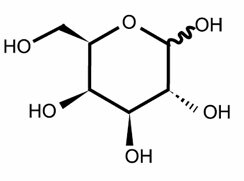 Yixin plant derived D-galactose controls Endotoxin at the very low level to ensure the highest quality in biopharmaceutical products. It can meet special requirement less than 5 EU/g or more stricter requirement.